Since beginning of this month, I've already had the intention to bake Christmas Fruit Cake. 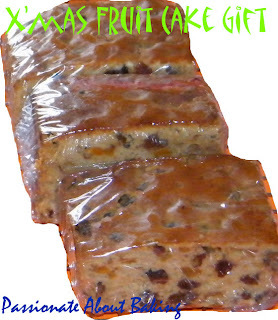 I surfed the web, reviewed lots and lots Fruit Cake recipes, and they all looked almost the same to me! How to decide? So I asked around. My baking buddy, Doris, gave me a site for the fruit cake. She has been baking fruit cakes for years and gave me her advice. Then there was a collegue who has been baking fruit cakes for quite a while too. She has been using Yochana's recipe and it's proven for her that her family finishes them up before the cake can keep another day. I don't used to like fruit cakes. I find them to be too sweet for my likings. Perhaps, as I aged (have I really? ), my taste seemed to have changed. Those stuff that I previously don't like, I tend to take them now. For example, mooncakes, yellow ghee noodles, and now fruit cakes. Doris told me to soak the fruits for as long as I can. I heeded her advice, soaked for two weeks. I soaked about three batches. Since my colleague recommended Yochana's recipe, I tried it. It was really the dense kind. I was hoping for a lighter fruit cake though. It might not be the truly traditional kind. Finally, for my second attempt, I decided on Wen's light christmas cake. I would truly prefer a lighter cake. 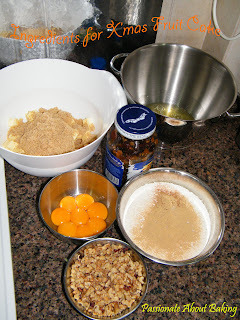 The method used in her recipe was very similar to making kueh lapis. I thought that might be good. And as if the quantity for a 9" is not enough, I made one and half times the recipe. Imagine the strength I need to use to fold in the fruits, flour and the meringue! I still find it rather sweet though. However, I really like this cake. I made two 7" square loaves, and sliced them into smaller portion as a gift for my family and colleagues. I hope they like it as much as I do. Thanks Doris for all your advice and suggestions! :) Your fruit cake is equally good too! Nice fruit cakes! I really hope can try it. 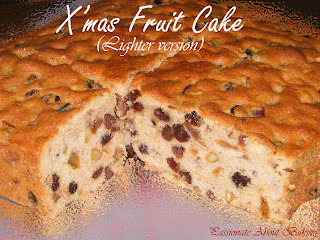 I didn't bake fruit cake this year, may be will try out your recipe next Christmas! Wishing you have a wonderful time with your family and friends! God bless you! Thanks Grace! 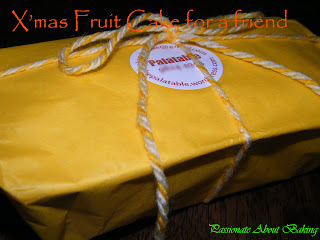 You don't have to wait till next year X'mas to bake fruit cake. You can bake it anytime when you are ready! Have a Merry Christmas and a Happy New Year to you too! Take care! I know what you mean about liking things you never liked in the past. It's the same with me! But I still don't like fruitcakes! ;) It's funny. I like all the individual ingredients that go into the fruitcake, but I don't like all of them together in a cake. Having said that, I think you made a wonderful version! And that wrapping is just precious. Merry Christmas to you and your beautiful family! Thanks for dropping by. Actually I'm completely opposite from you. 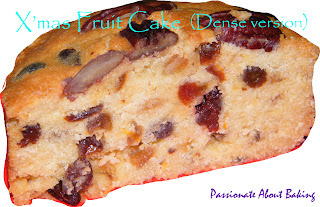 I don't like the individual ingredients in a fruit cake, but when combined together, I seemed to like it! Hahaha... Thanks for your compliments!